Big kitchen or small, an island is a multi-functional component that, from prep area to seating, offers many practical uses. Even small kitchen islands can have a big impact. The trick to making it work is to design the room’s layout and the island itself with maximum efficiency in mind. If you’re remodeling your kitchen and want to add an island, read on to discover just how easy it can be, regardless of square footage. In Tallahassee, there are a lot of older homes that don’t have pantries, so the additional storage space of an island is appealing to many homeowners. 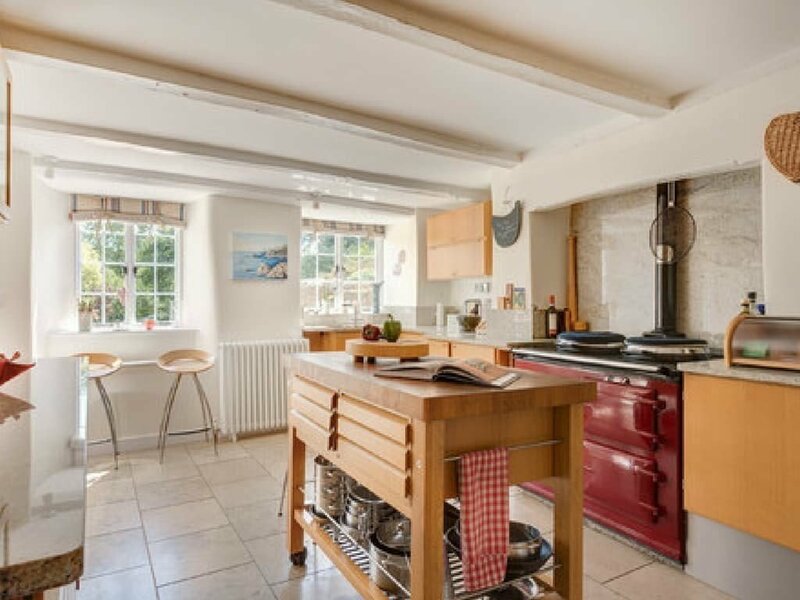 Some wonder, though, if putting an island in a small kitchen will take up more floor space than it’s worth. Use as an eating counter. Offer additional storage via drawers, cabinets, shelves, and hooks. No matter which island you ultimately decide on, make sure it’s sized correctly and does not interrupt your kitchen workflow. Can I Add an Island to my Small Kitchen? Will it be in the way? An island can add much needed storage and counter space but if it is placed between to work areas, like your sink and cooktop, for example, it can create an obstacle you constantly have to walk around in order to prepare a meal. The NKBA offers standard kitchen space recommendations: For work centers, no leg of the work triangle (the distance between the cooking, prep, and refrigeration areas) should measure less than 48 inches, and should not intersect an island or peninsula by more than 12 inches. An island needs to have a minimum 36” of space all round it. 42” inches is better and 48” is ideal. The space from an island to your perimeter cabinets shouldn’t exceed 60 inches. For a 36” tall island At least a 12” overhang is required, though with 12” your knees will most likely knock against the back of the cabinet. 14” is better and 16” would allow you to sit with your legs completely under the counter. If the island is 42 inches tall then 14 inches is an adequate overhang. So what do you do if your kitchen doesn’t quite meet the space requirements for a kitchen island? You get creative! While the work triangle is the golden rule of kitchen design, depending on your needs, you may find it best to bend the rules a bit. In truth, as long as the island doesn’t block a doorway or prevent you from opening appliances or cabinet doors, you can find a way to make any option work. By reducing the depth of the island cabinet from 24 inches to 18 inches you might be able to fit an island in. Galley kitchen: Creating a midpoint prep station for a narrow kitchen makes meal preparation easier, adds a “drop zone” near the refrigerator, and lets one person slice and dice while the other sautés the veggies. 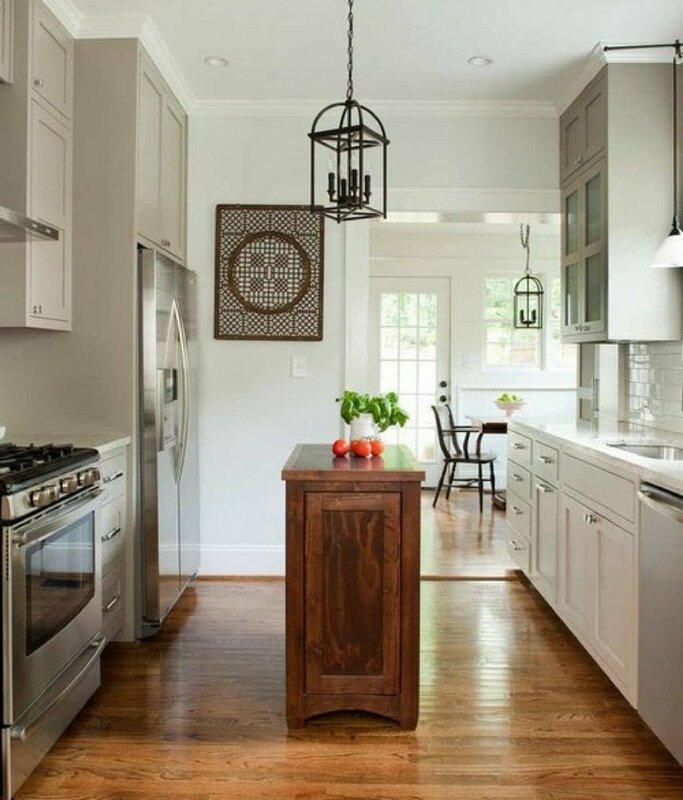 We often recommend a “skinny island” for galley kitchens with 18-inch cabinets instead of the standard 24-inch ones. Chef’s kitchen: Rolling islands and carts are great choices for people who do a lot of cooking but want to store the island against a wall or in another space when it’s not in use. This type of island offers a ton of available features: pull-out surfaces for chopping or kneading, drop-down leaves, handles that do double duty as towel bars, adjustable shelves, and butcher-block surfaces. A big advantage to a rolling island is that it can be larger than a fixed one. If you need to grab something from the fridge or put a casserole in the oven, you simply push it out of the way. Multi-purpose kitchen: The farm table is the original workhorse of the kitchen and was often used in the center of the kitchen as an island. The table also served and the dining area, it was where homework was done and household meetings were held. Depending on your preferences, you might want to use a sturdy table, with or without wheels, as an island. With a drawer to hold cookie cutters, shelves for bowls, and a butcher block top, it’s the ideal baker’s island. Vintage is often a great way to go; narrow sofa tables and consoles are usually well-constructed. And in a pinch, the table can be used to seat extra guests or serve as a buffet station. For some smaller kitchens, an island simply won’t work with the existing layout. In that case, you might want to consider installing a peninsula which gets you the storage and prep work you need without blocking important pathways. Small-scale islands do not need to be expensive or custom made. There’s an incredible variety of off-the-shelf options available for kitchens of any shape or size and for all budgets. You can give one a test drive and see it if it meets your needs before installing it permanently. Or, let our designer show you how different islands will look in your newly remodeled space. An island can enhance your small kitchen in many ways and, with good planning, can increase the functionality of the room. If you’re ready to talk about a kitchen remodeling project for your Tallahassee area home, drop us a line today. We look forward to meeting with you! ← Can You Install a Barrier Free Shower in Your Home?